Oh hey. We’re accepting submissions. Note the giant poster above. So listen, Pam, I have a question. 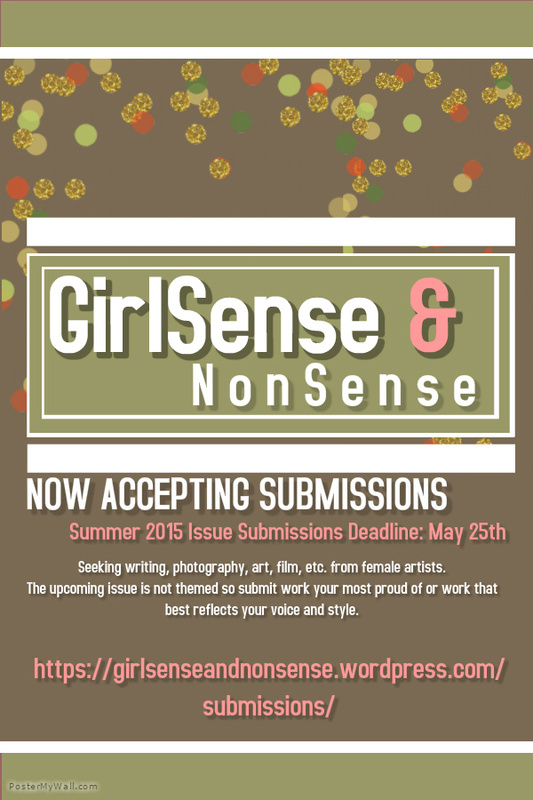 Why is the upcoming issue of GirlSense & NonSense Magazine not themed? So listen, that’s a really good question, Pam. We came up with a really interesting theme for the Spring Issue based on this really cool book and we thought we were so cool. Girls started submitting and some of it responded to the theme and some of it didn’t. After pondering why this was happening and concluding that I was fairly lame and thus, not prepared to create cool themes for a digital magazine, I decided to sit down and have a good read-through of the submissions hitting our inbox. My conclusion was this: girls have stories to tell and things to say and dammit, they’re gonna say it (with words or a camera or a paint brush) no matter what the theme. So I just didn’t want to get in the way anymore. The Summer 2015 Issue is going to be what you all make of it and that makes me really excited and happy and bit relieved too. So submit your stuff and submit as much as you want. We may not publish everything but we also have a backlog, which sort of works as a wait list, so your work may be published in a later issue. We’re also running a cover art contest through May 20th. Do I need to say that it’s kind of a big deal to have your work featured on the front page of anything? Yeah, I just said it. Get going, girl! We love receiving your submissions and we can’t wait to see what you come up with next!